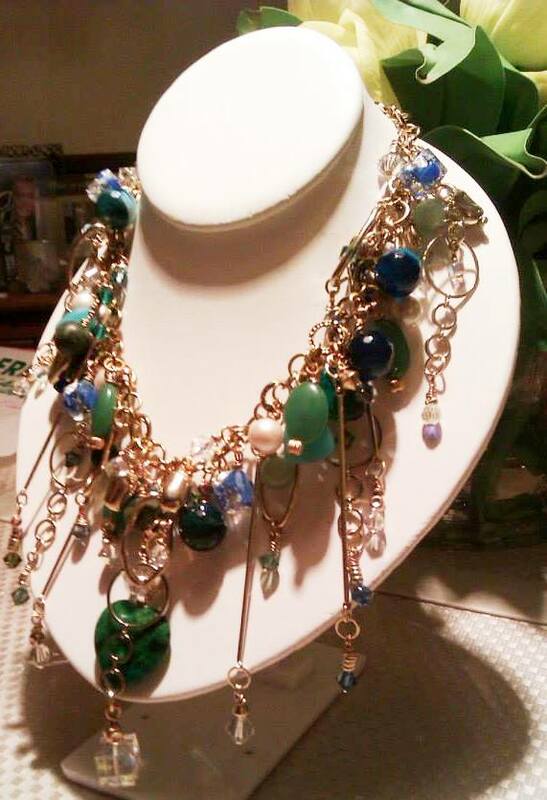 I’ve created two necklaces recently which I am especially proud of. They are on the artistic side and not especially for everyday wear. 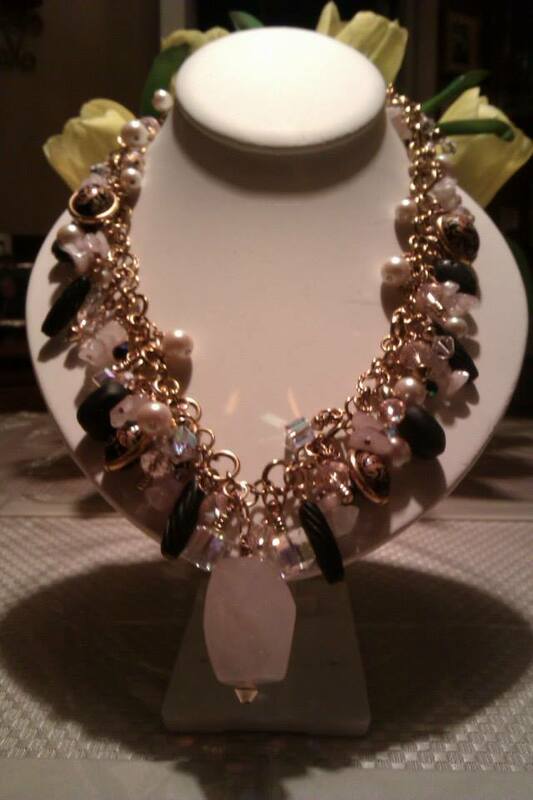 The fist I’d like to share is a necklace I’ve named “High Drama” for its dramatic presentation. 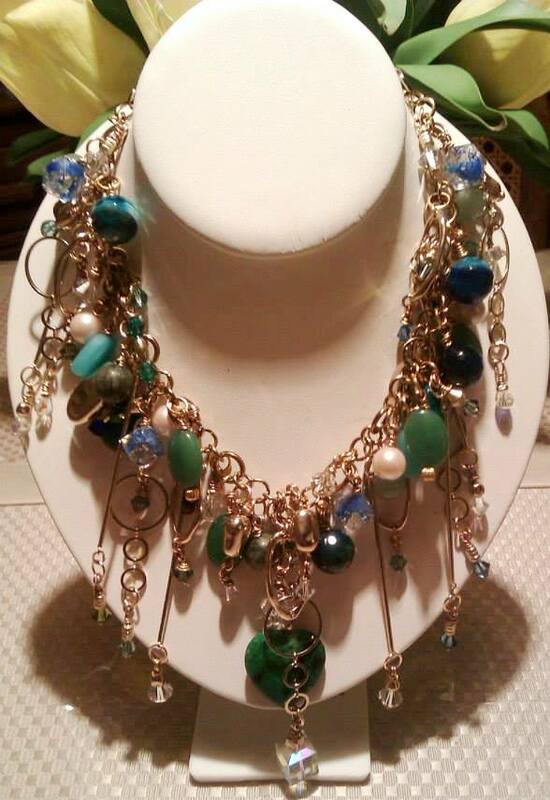 It has been made using various stones in blues and greens, Swarovski crystals of the same color and the gold circles and long pieces are actually vintage parts which I took from two simple chain necklaces that had these parts. This is probably my most artistic piece to date. What’s especially fun is that the clear cube beads with the blue running through them glow in the dark! 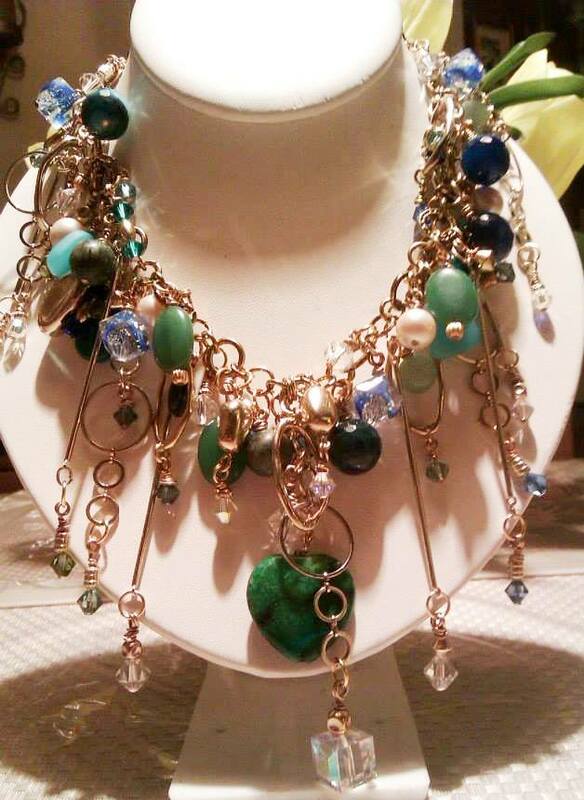 The center of the necklace features a heart made of Chrysocholla, as well as a 14mm Swarovski Crystal Aurora Borealis cube. 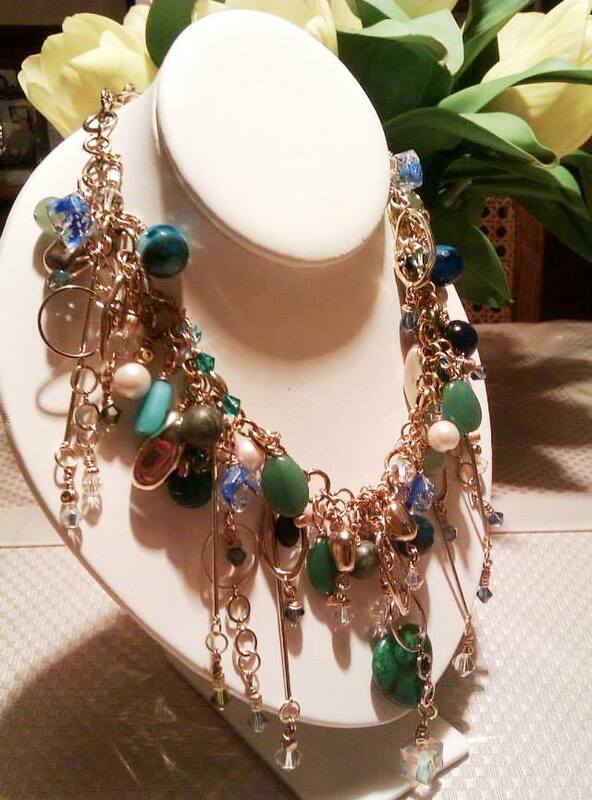 Other stones included are Green Aventurine and Green Jasper. 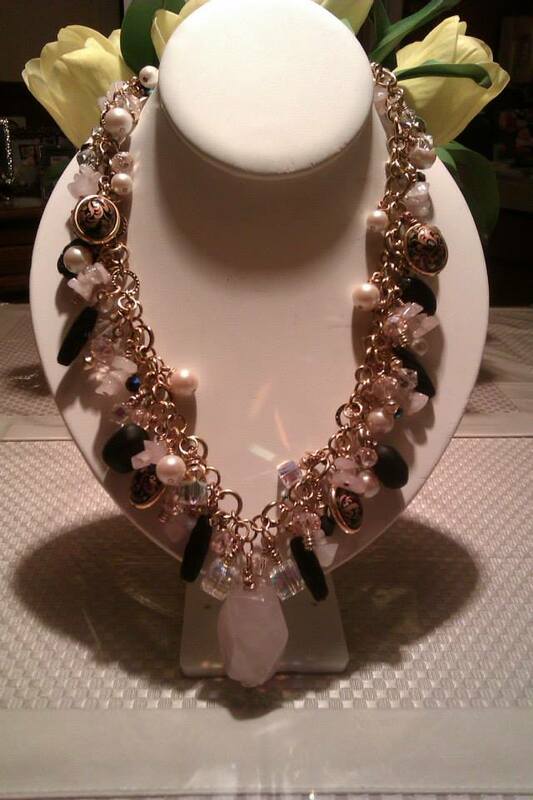 There are also some faux pearls mixed in. 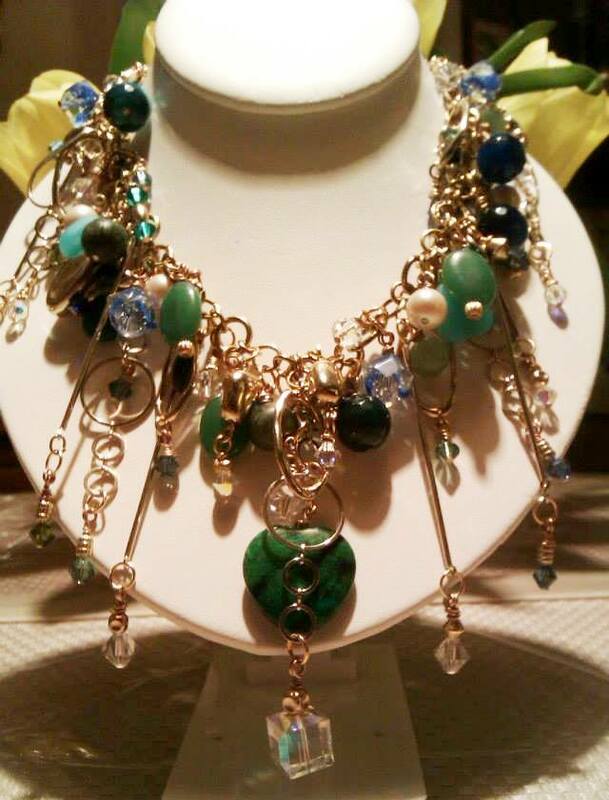 The Swarovski bicone crystals are all 6mm and are in Crystal AB, Erinite, Olivine, Denim Blue, Sapphire and Turquoise. 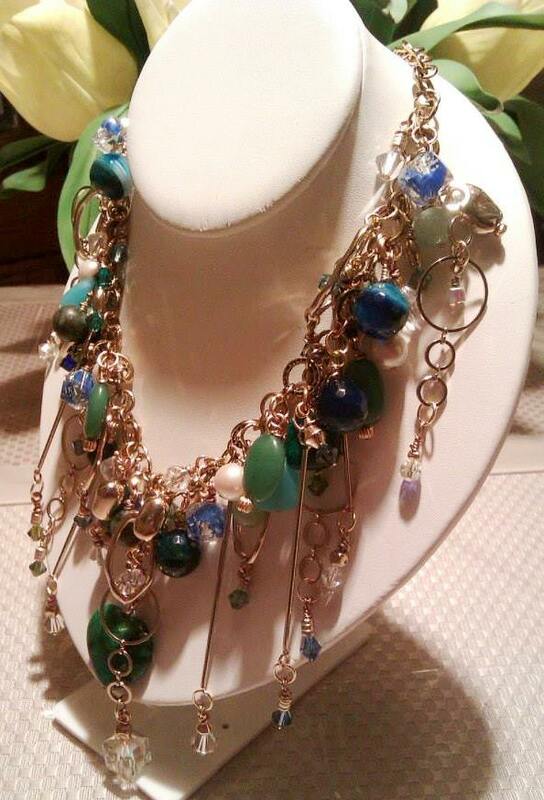 You will also find some light blue sea glass within the necklace. 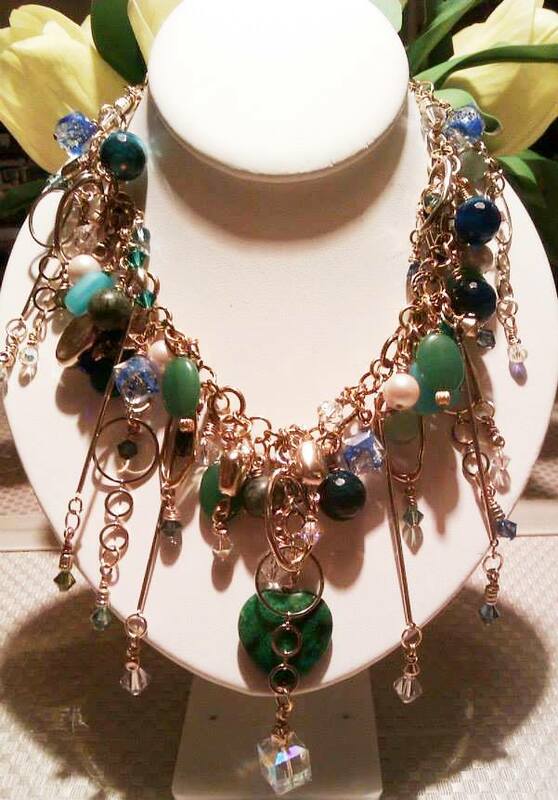 The beading is a little more than half way around the necklace whereas the remainder is done in beautiful gold tone circles of various sizes and designs. 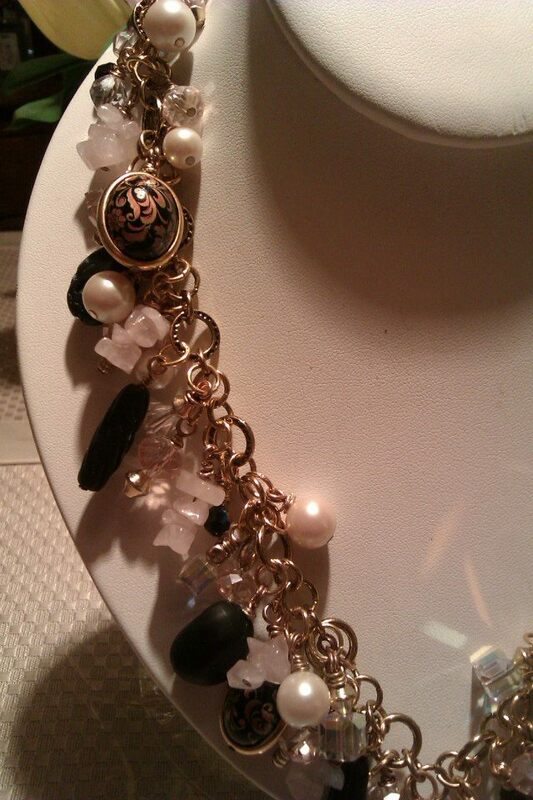 It has a good-sized gold tone lobster clasp. 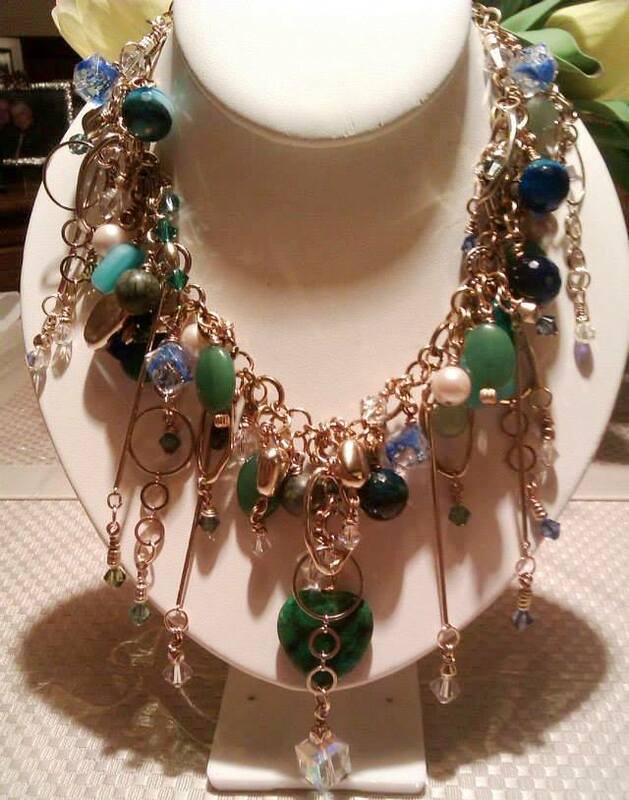 If you are interested in finding out more about this necklace, including purchasing it, please email me at mark.thaler@outlook.com. 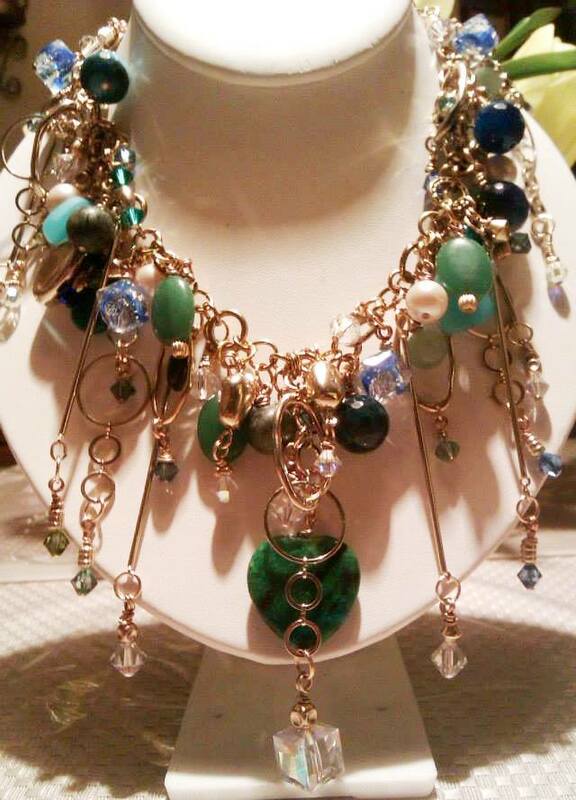 I can create a special listing in my ArtFire studio (I’m now on Etsy!) where it may be purchased. 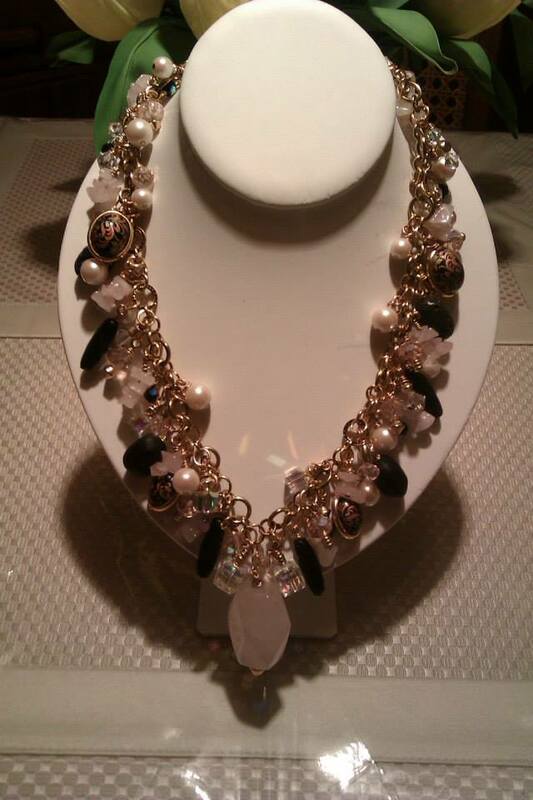 The other necklace I’m featuring today is one that I have named the “Pink Ladies Necklace”. It’s name has been derived from the Pink Ladies characters in the movies “Grease” and “Grease 2”, where Pink and Black were their signature colors. 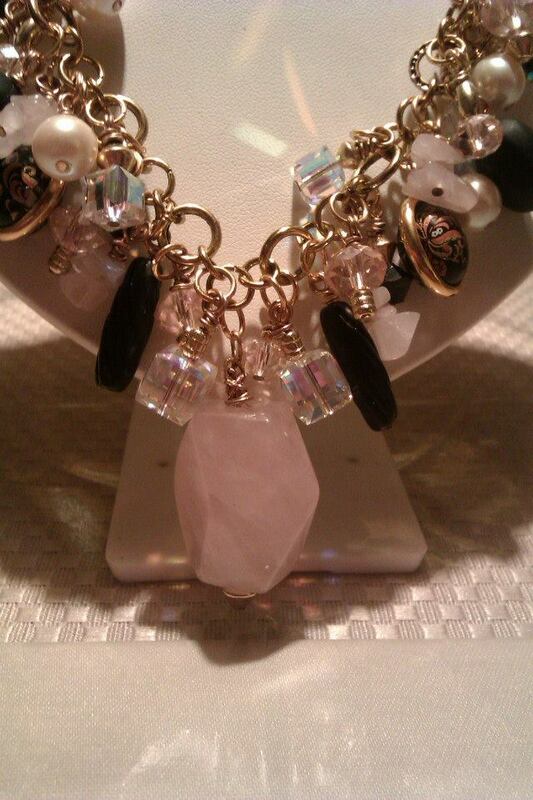 This necklace features Rose Quartz chips and a large Rose Quartz focal piece with a very unique shape. 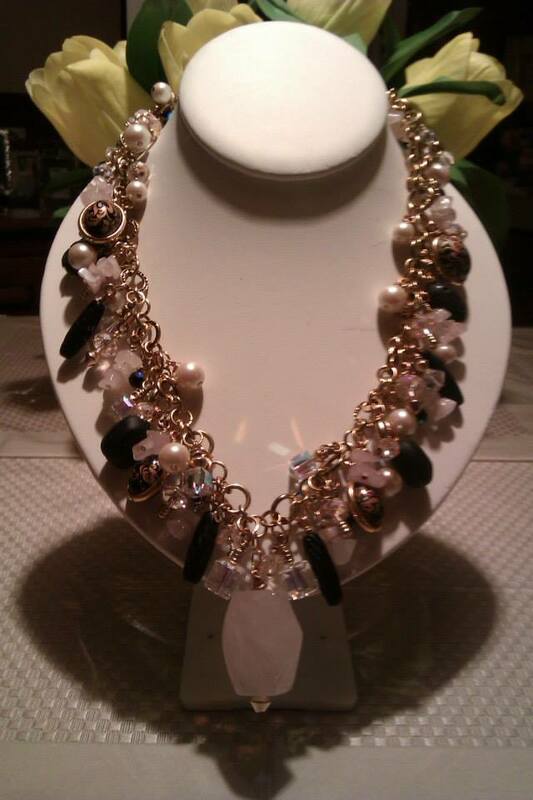 Accompanying the large focal piece are two Swarovski Crystal Aurora Borealis 12mm cubes. 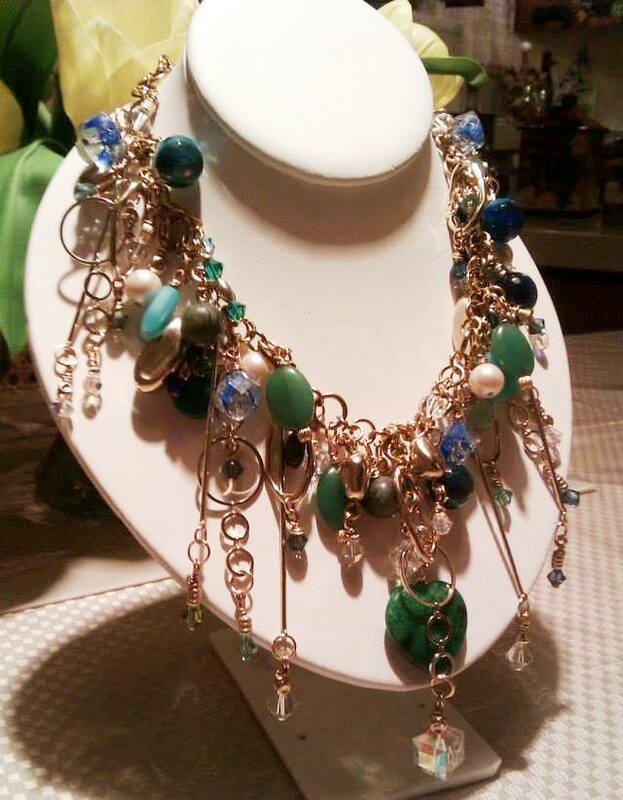 Czech crystal rondelle beads are included throughout the necklace and have a lot of gorgeous shimmer. 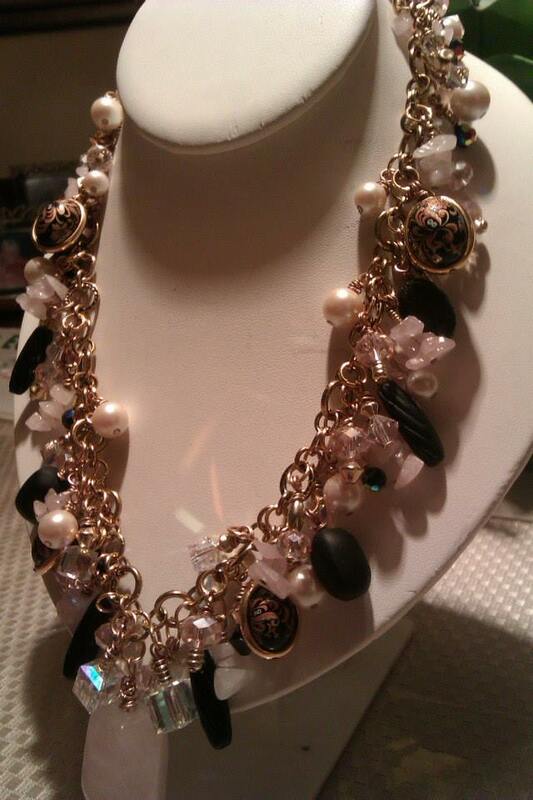 I have also added black sea glass and black enamel beads, along with some Swarovski “Jet AB” rounds and faux pearls. 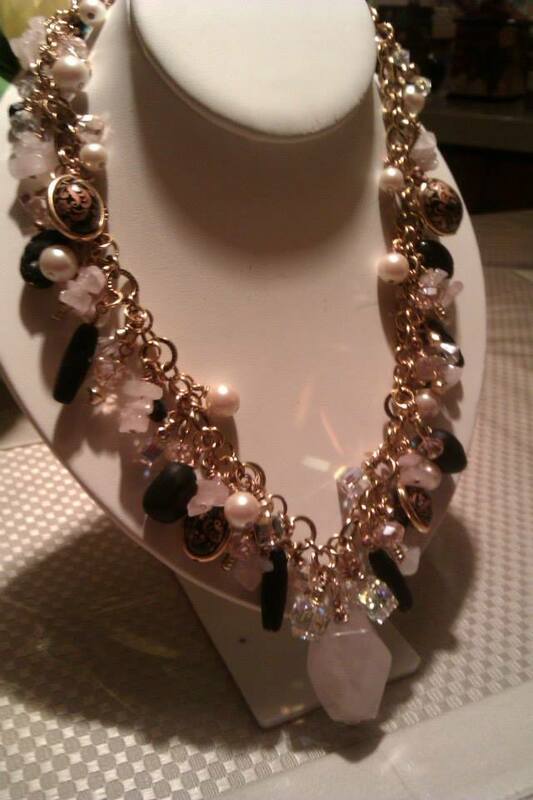 The black “egg” type beads with the floral design are vintage from the 1960’s and they have a gold tone edge around the center. Again, if you would like more information or are interested in purchasing this piece, please contact me at mark.thaler@outlook.com and I’ll be happy to assist you.